Mondrian is a sophisticated modern urban resort located in the heart of the entertainment capital of the world on top of the famed Sunset Strip. Mondrians location is the ideal hub to access numerous area attractions such as Sunset Plaza The Beverly Center Melrose and Santa Monica Boulevards Hollywood Walk of Fame TCL Chinese Theater Kodak Theater Getty Center UCLA and world class shopping on renowned Rodeo Drive. So much more than just a place to stay for the night Mondrian transforms staying at a hotel into a fun exciting and adventurous experience that lifts the spirits and touches the senses. Visionary designer Benjamin Noriega Ortiz has rejuvenated Mondrian the quintessential California hotel offering glamour and fantasy in a casual and relaxed environment. The hotels 236 rooms and suites feature floor to ceiling windows with stunning views of Sunset Boulevard and downtown Los Angeles. Additional amenities include silestone tiled bathrooms with waterfall shower fixtures a state-of-the-art HDTV is hidden in full length custom designed mirrors oversized daybeds sustainable bamboo floors and Malin and Goetz natural products. Bath amenities are just a few of the little luxuries awaiting guests of Mondrian. 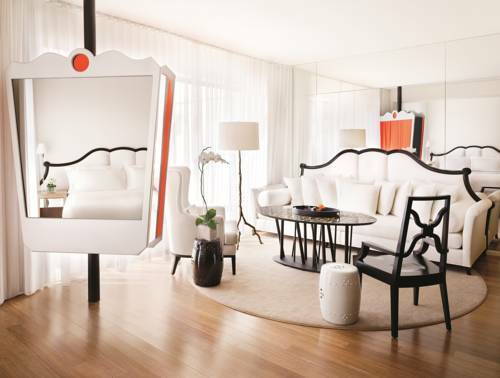 Morgans Hotel Group invites you to check-in to the Mondrian Los Angeles. Located at the peak of Sunset Boulevard and the base of the Hollywood Hills. The House of Blues and Comedy Stores are across the street. Beverly Center is 1 mile away. Universal Studios is 5 miles away. Walking Distance to restaurants/ shopping/ nightclubs/ Sunset plaza and art galleries. It is located in the heart of hip West Hollywood.